NCAA College football rankings can sometimes vary with the day of the week or so it seems. 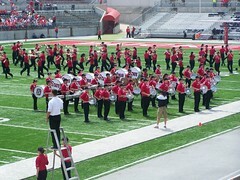 Consider number 19 in the 2011 football poll – The Ohio State Buckeyes. Magazines with deadlines back in April selected OSU to finish much higher, as high as #9 in one case. They were also chosen to triumph in the Big Ten Conference at that time. Now, it seems, Ohio State’s fate will be up in the air until sometime in October, when four crucial players are reinstated after a five-game suspension for NCAA violations. The NCAA needs to investiagte quicker and issue decisions faster. THe Reggie Bush investigation dragged for MONTHS. If the NCAA worked more efficiently, then it be the answer.